This is an old article I found in a copy of The Straits Times from 1935. I thought it was an interesting read and it mentions a rare Gibraltar error on a sheet full of 120 stamps. It also briefly mentions Captain H. St. C. Garrood who designed the nice views of Gibraltar for the KGV definitive and later the KGVI definitives. Hopefully no one will mind me reproducing this here. N o matter how often one has passed outward bound or homeward, the sight of Gibraltar brings every-one on deck. We are now within a few weeks from the philatelic jubilee of Gibraltar, which has had its own postage stamps from New Year’s Day, 1886. For the first forty-five years they had always been of the conventional typo-graphed Queen’s Head or King’s Head of standard patterns. It came as a surprise four years ago when a change was made to an intaglio view series for the low de-nominations. This was designed by Captain H. St. C. Garrood, and the printing was still done by De la Rue and Co, who will celebrate their jubilee as printers of all the Gibraltar stamps except this year’s silver-jubilee series. 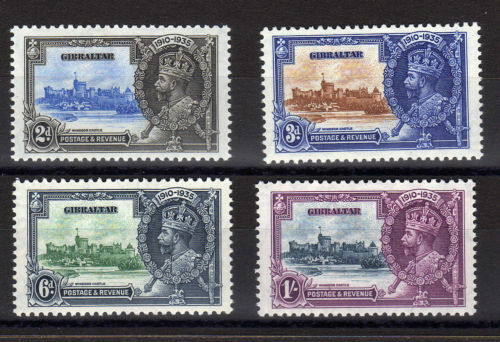 It is just a pity that the Gibraltar jubilees did not come into the jubilee groups entrusted to De la Rue, seeing that the four denominations of this year are the only Gib stamps that are not of this firm’s manufacture. 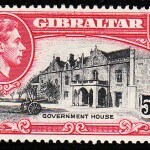 Gibraltar is a favourite Colony with stamp collectors, partly, no doubt because of the fascination of its impressive history and unique position. But also largely because its philatelic emissions are still not too difficult for the average collector to encompass. In the fifty years since the first issue our “Gibbons” only lists 117 different stamps, and “Whitfield King” 104. Of these few are at all expensive, while only one is a rarity. The rarest stamp of Gibraltar is by way of being a real curiosity. It is peculiar in that the design was printed, but the value or denomination was not. The issue of 1880 was printed from a key-plate bearing the design common to all values. The denomination in the old Spanish currency of centimos was added afterwards from a duty plate. One sheet of 120 stamps printed in carmine for the 10 centimos (about 1d) stamps missed going through the press the second time to have the value printed in, so the value tablet remained blank. This is one of the very rare instances in which a stamp error has slipped past the lynx-eyed examiners at De la Rue’s. From the stamp stock at Gibraltar a post-office clerk was about to serve a customer with a ten centimes stamp when he noticed the label was blank. He looked at the sheet and found all the 120 were alike. He put it aside, and served the stamp from another normal sheet. As it would have been against the post-office rules to buy the freak sheet himself, he arranged for a friend to come in and buy it. The friend did, and after a little while I placed the freak stamps with a speculative philatelist visitor to the Rock, at (it is said) about £3 apiece, quite a nice profit on stamps bought at the post-office at a penny each, but still out of all proportion to their value on the stamp market today; the stamp is priced at £90 in the new Gibbons catalogue. Two recent stamps of Gibraltar have had a sensational rise in value. These were the 4s black and carmine, and 8s purple and green of the King George series. Issued only in 1924, they were suddenly withdrawn in 1925 and promptly soared in value on the stamp market. The 4s. is now worth £2 5s., and the 8s. costs £8, showing a nice profit for those who got them through the new issue dealers at the time, at a small commission over the face value. At the time of writing the four jubilee stamps 2d., 3d., 6d. and 1s. are in current use in the island, and two of them temporarily supplant the 2d. and 3d. in Captain Garrood’s view design. The jubilees are to be kept in use to the end of the present year. Meanwhile the 1d. scarlet and 1½. red-brown view stamps are the denominations in chief use. The view stamps are in keeping with the present policy of the colony in advertising itself in its peaceful aspect. Long regarded as the naval key of the Mediterranean we find on letters nowadays the slogan postmark “Gibraltar – the Travel key of the Mediterranean.” The stamp design scarcely suggests the stark majesty of the Rock, but it was intended to call attention to the colony’s attractions in peace rather than in war. Frederick John Melville (1882–1940) was a British philatelist, prolific philatelic author and founder of The Junior Philatelic Society. He was also a founder in 1907 of the Philatelic Literature Society. Melville is a member of the American Philatelic Society’s Hall of Fame and was a signatory to The Roll of Distinguished Philatelists in 1921. ~ From Fred Melville on Wikipedia. Gibraltar was known to the ancients as Mons Calpe, one of the Pillars of Hercules.